DENVER — Black Shirt Brewing Company is excited to announce the arrival of its new head brewer, David Sakolsky, who joined the Black Shirt team November 19. Sakolsky is a native of New Hampshire, where he founded and co-owned Deciduous Brewing Company in 2014. 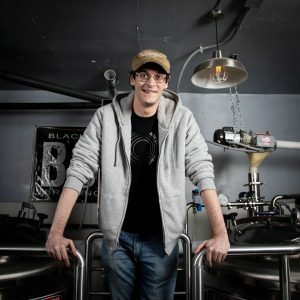 Prior to that he worked for Blue Lobster Brewing Company and has apprenticed for both White Birch Brewery and the venerated Hill Farmstead Brewery in Greensboro Bend, Vermont. With a deep appreciation and love for farmhouse and mixed-fermentation styles, Sakolsky brings to Black Shirt an infectious passion for brewing elegant, refined, compelling beers. He’s particularly fond of styles rooted in Germany and Belgium, such as Goses and Saisons, but he’s also enjoys brewing big Imperial Stouts and English Barleywines. Launched in 2012 when the brewery opened its doors, the Red Ale Project was the physical manifestation of Black Shirt’s core philosophy: “Do one thing and do it well.” As Black Shirt’s flagship enterprise, the Red Ale Project grew and thrived under the watchful eye and creative oversight of Black Shirt co-founder, Branden Miller, and former head brewer, Aaron Holstad. Pushing the limits of the style and exploring its potential was at the heart of the project, resulting in several beers that developed a major fan base, including the beer that started it all, Colorado Red Ale, as well as Red Evelyn Imperial Red Rye IPA and Pistachio Lavender Rye Pale Ale. Black Shirt has no intention of leaving those beers behind but will instead augment its current offerings with Sakolsky’s creations. Sakolsky has found inspiration in Black Shirt’s storied beginnings, DIY ethos, and tight-knit crew. “The camaraderie, transparency, and skill of the staff is amazing!” said Sakolsky. “I’m honored to have the chance to do my part for the customer experience they provide.” Given the broader range of beers that will be available, the brewpub plans to develop new food pairings that complement a variety of distinct flavor profiles. For his first brew, Sakolsky has a dry-hopped, Americanized Gose in mind, which should hit the taps by the new year. Craft Beer. Pizza. Music. Community. Black Shirt Brewing Co. is a small craft brewery located in the RiNo neighborhood in Denver, Colorado, serving delicious hand-crafted beer and pizza every day starting at 11 am. During the summer months, we host free live music every Friday night and Saturday afternoons in our beer garden, and also feature acoustic acts throughout the year. Regular events include monthly vinyl listening parties with Vinyl Me, Please (second Thursday of every month) and Think & Drink Pub Quiz every Tuesday. Genuine. Passionate. Soulful. Authentic. Beer.